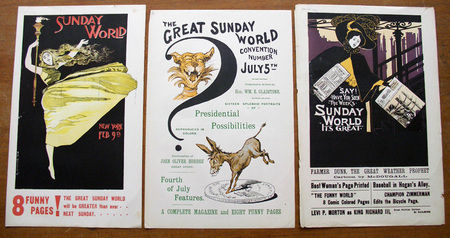 We recently acquired nine color letterpress advertisements for Joseph Pulitzer’s Sunday World, the heavily illustrated Sunday edition of his daily newspaper The New York World. 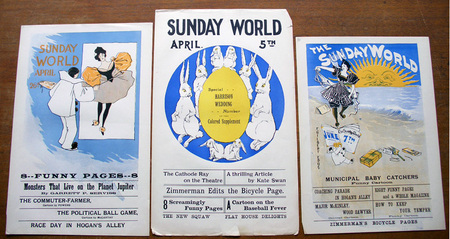 Pulitzer increased his advertising in 1895, when William Randolph Hearst established a rival paper The New York Journal and the two vied for subscribers. Note in particular the announcement of an article by Garrett Putnam Serviss (1851-1929) describing “Monsters That Live on the Planet Jupiter.” Serviss was a trained astronomer with degrees from Cornell and Columbia, who wrote early science fiction. 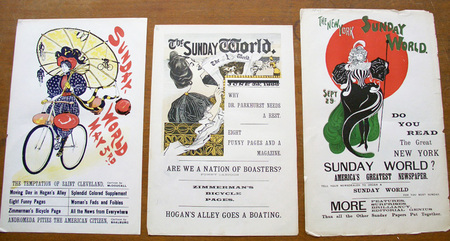 He published an unauthorized sequel to War of the Worlds by H. G. Wells, called Edison’s Invasion of Mars. This was followed by a second book about life on Venus and a third about the Moon. His story about Jupiter never made it beyond the pages of The Sunday World.